Construction: Black powder finished steel frame provides up to 500 lb. weight capacity, durable, heavy duty and rust-resistant. Basket with customized tie-down points for users' convenience. Compact: inside dimension: 18" x 52" x 3.4"; outside dimension: 19" x 53" x 4". 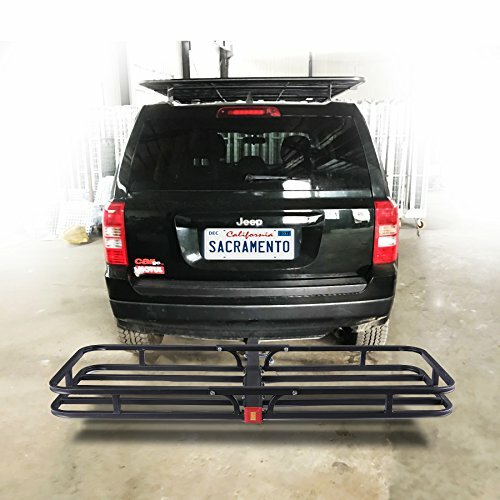 Perfect rack size to haul coolers, luggage, camping gear and more! Installation: Just tighten the screws and plug the cargo carrier into the hitch, and you are ready to go. And this cargo carrier can be removed from your car while it's not in use. Warranty: Backed with 1-year warranty, 100% money back or replacement.